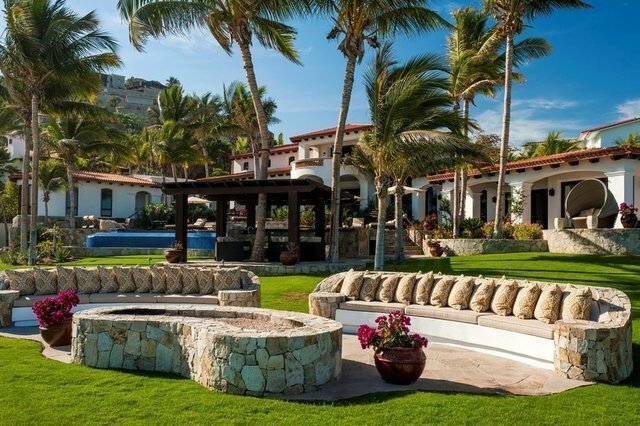 Bespoke 12,000 square foot residence situated on over two acres of beachfront paradise on the Sea Of Cortez; Bahia Rocas is a 9-bedroom estate, within the gated community of Villas Del Mar, adjacent to the One & Only Palmilla. Featuring private tennis court and separate cottage with access to golf, marina, dining and spa this property has everything for family getaways and entertaining that makes a statement. Exceptional Spanish architecture meets modern comfort and the very best of finishes, wrought-iron fixtures, intricate tile work and colorful linens reflect the artisanal skill and vibrant spirit of Mexican design. Free form infinity pool, swim up bar, two Jacuzzis & beachside firepit are set amongst the tropical gardens with breathtaking ocean views.